This post details some common mistakes that marketers make when targeting the US Hispanic market and provides suggestions on how to better develop your strategy to address this market’s needs. One of the most common mistakes marketers make when entering the Hispanic market is to assume that Hispanics only speak Spanish and only watch Spanish-language media. And while the number of Spanish-preferred Hispanics is still large, it is not the majority anymore. Just about any study you read these days about Latinos in the US talks about the rise of the second generation, which marks a fundamental shift in the growing US Hispanic population. The number of US-born Hispanics surpassed the number of foreign-born Hispanics for the first time in 2000, and that trend is projected to continue. Currently 60% of Hispanics in the US are US-born. What does this mean for your content marketing strategy? 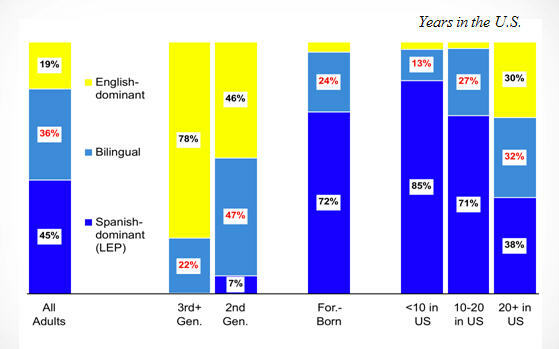 More Hispanics are/will be either bilingual or English-dominant. See the charts below for the breakdown of Latinos by Language Fluency and Generations from the Pew Hispanic Center. Clearly, if your product or service has a target market of Hispanics who are older than 25, then developing appropriate Spanish language content should be a big part of your strategy. 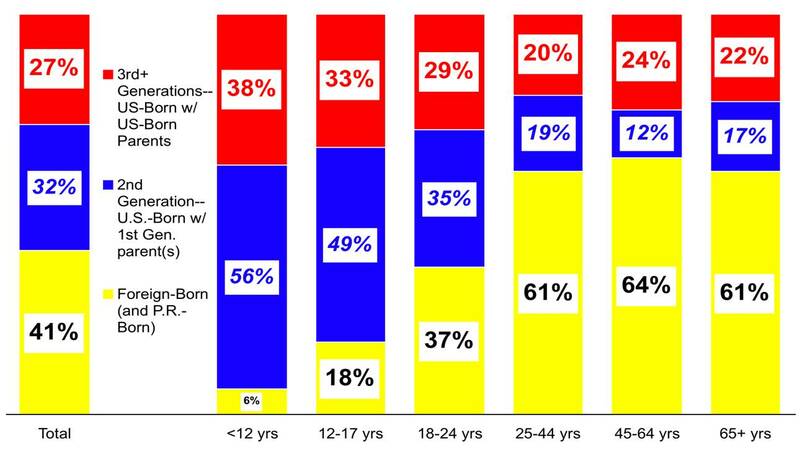 But if you are trying to appeal to the younger demographics, clearly Spanish-only is not the way to go. While you certainly need to translate some content when targeting this market, you should also consider their differing information needs. For example, a bank that wants to attract US Hispanic customers may simply translate their website into Spanish and think their job is done. However Hispanics may need more information than just descriptions of products and services (which even in English are hard to understand). In my experience, Hispanics (like everyone) are looking for companies that also provide “educational” content that fits their needs. For example, let’s say a Hispanic family is interested in a 529 Savings account for college. Instead of simply talking about the features of the plan, offer more information about college education in general. A little more information will go a long way towards gaining them as a customer. It means you care! Don’t fool yourself (or be fooled by your agency) into thinking that you are already capturing English-dominant US Hispanics through your general market advertising. Chances are you are NOT. Here are three things you can do to start addressing the needs of this audience. For example, if you are a jeans manufacturer whose sweet spot is consumers aged 18-24, and your distribution is mainly in the Southern and Western United States, then you need to think about Latino youth who may speak some Spanish but who are more comfortable with English. Check out what Ford has done with their new Ford Fiesta campaign. Understand your brand’s consumer touch points as language and messaging may vary. What are the media preferences of your target market? TV/Cable, Internet, Facebook, Twitter, mobile, magazine? Make sure your brand story is properly adapted for the medium. Again, Ford Fiesta does a great job of being “where” their target market is. Hispanics tend to live in multi-generational families, so bilingual information satisfies both the younger generations and the older ones at once. Just make sure that you don’t make assumptions about what people “know”. Explain everything — like you’re talking to a 5th grader — and make sure it is quality content in both languages. Does (or should) your content marketing plan include a strategy for US Hispanics? If so, what challenges have you faced or what suggestions can you add?